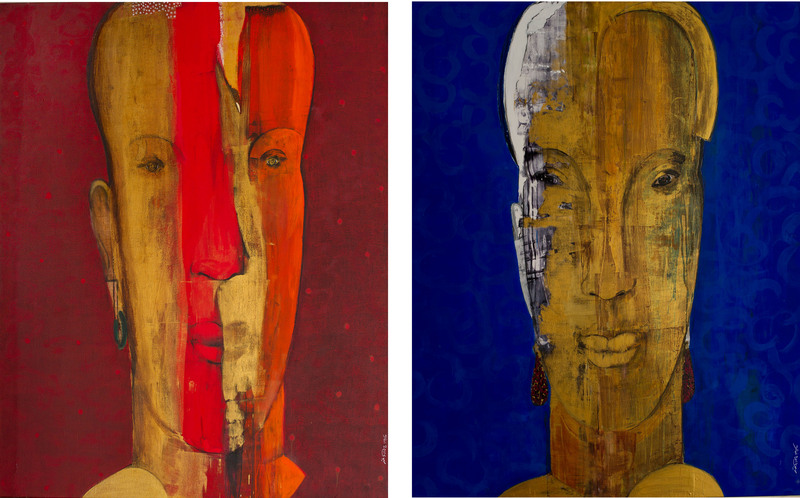 Adel El-Siwi’s elongated faces have a monumental presence in The Red and The Blue diptych. The polarities of warm and cold are instantly suggested through the dominant colour fields. A deadpan face is presented on each canvas portraying faces of tribal features. The inherently vertical nature of the work is one that perpetuates elevation. Recalling the African totem masks Picasso discovered at the Trocadero Museum in Paris during his Black Period or époque nègre in 1906-1907. Siwi’s face dominates the large canvas where each figure is laboriously painted with gold leaf. The female appears to be emerging from the blue monochromatic background. The contours of her face are delicately rendered. The male head appears slightly tilted and has a red band interrupting the centre of his face. There is a push and pull gravity between the two figures, even as they habituate separate spaces – the male and female versus the hot and cold. Siwi is celebrated for his sense of flat shapes of lines offering a voyeuristic journey into an exotic where colour reigns. For more information on the auction & the lot above, click here to visit the auction’s page on Christie’s website. Click here to view available artworks by the artist at Al Masar Gallery website.